Wile E. Coyote (c) Warner Bros. 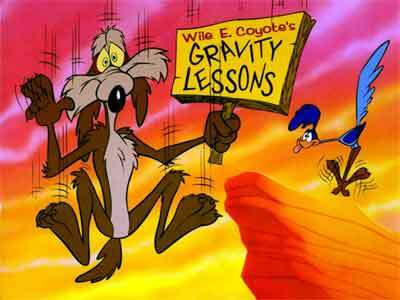 When the Coyote makes his mistake and runs over the edge of the cliff, he hangs there for a little bit. We all know he's going down. He know's he's going down. It just plays it for laughs for a few seconds and gravity takes hold. Organisations do this too. They run off a cliff, into a place where the rationale that kept them up is gone. They hover their, legs kicking the air for while, sometimes years, until down they go, ACME rocket boosters and all. Sometimes they see it coming and slip in a double take. Sometimes not. Know any victims of the Coyote effect? It's really hard to tell. Unlike Wile E Coyote, the bigger something is, the longer it will hang in mid air before crashing. There's too much mass and inertia. Too many people are involved in the little details, no one can see that the ground isn't there any more. Those that can, probably don't think it's their job to tell anyone. Who would listen anyway? In the private sector, economics enforces gravity. If customers stop coming, the balance sheet goes bad, and one fine day the boss finds he can't make payroll next week. Down she goes, without too much delay. Sometimes, even in the private sector an organisation is so big it distorts reality around it, and can draw in other resources. Because no one really believes something so big can be broken, or can contemplate a world without it, or they believe that it's just a temporary problem, it gets bailed out by someone. This happens to banks a lot these days. In the state funded sector, it takes a long time for the Coyote effect to kick in, Decades, perhaps centuries. For example, in Ireland, we still have an office of the Chief Herald*. Killing state supported enterprises is politically difficult. No one wants to shoot the dog. Easier to keep feeding it taxpayers money and let the next government sort it out. Universities are particularly prone to the Coyote effect. The combination of state supports (especially in Europe), their hold on the public imagination, and their special relationship with time mean they can float in this air for a century after running off the edge of their reason for being. Universities haven't leapt off that edge yet, but the road is winding, and there's a lot of ACME equipment strapped on just now. But if they do go over the edge, the Coyote effect means it will be some time before anyone notices. A generation at least, perhaps two. But sometimes, for the lucky, the Coyote effect is no bad thing. It can carry you over a leap of faith. By time we all realise it, the other side of the canyon might be in reach. Or indeed, they may have grown wings. * I know virtually nothing about this office. It may, for all I know, do something extremely important, and contribute substantially to the state coffers. I cite it as an evocative per example only, and mean it's staff no offence.